This is a five-day (40-hours) course that provides the required knowledge and skills to design and build a complete Android™ application. It delivers an extensive training on the main Android SDK components and its interactions. The course is updated to include topics compatible with all Android versions up to Android 8 and the source code updated to API 27. Moreover, this course book uses Kotlin programming language instead of Java. Kotlin is a safe and concise programming language that promotes faster development of high quality Android apps. This course consists of 10 lessons; the first 3 focus on Kotlin fundamentals for candidates who do not have enough programming background or already have Java background only. The other 7 lessons focus on how to create Android applications from the beginner to the advanced level. The new features of the course include: more practical exercises and labs, easy to understand lessons, and is supported with graphics whenever possible. This course is adequate to provide trainees with the required knowledge and practical skills to be Android application developers. It has a duration of 40 hours and no prerequisites. This course is mapped for AND-801 exam. This course consists of 10 lessons; the first 3 focus on Kotlin fundamentals for candidates who do not have enough programming background or already have Java background only ; therefore, no prerequisites for this course. For more details, kindly check the course outline. 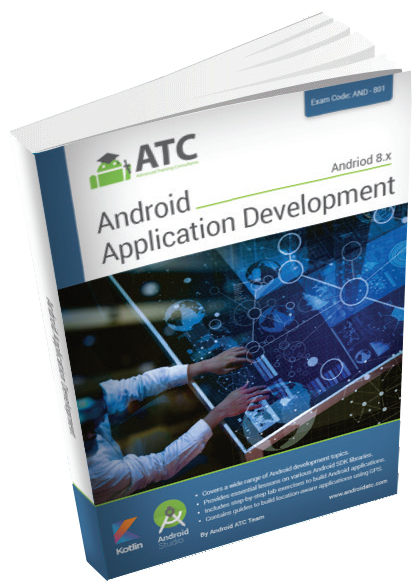 After completing this course, you will be ready for the “Android Certified Application Developer” exam version 8 (exam code: AND-801). This book can only be ordered in hard copy format. The total price of the book including shipping and handling is 65 USD (Delivered globally within 4 business days using express shipping). Click here to place your book order.